One year ago locals from Plovdiv together with guides from Free Sofia Tour Association (now Association 365) took the initiative and started a walking tour in Plovdiv. The name was easy to choose- Free Plovdiv tour- connecting the name of our city and the name of our organization. The date was the 13th of July, Friday, which is our lucky number (our two other projects were started on the very same date- the 13th of August 2010 and the 13th of April 2012. Almost 2000 guests from all over the world have joined the Free Plovdiv Tour and discovered the city with us. These are 2000 people, who saw the city through our eyes and hopefully fell in love with it. Most of our guests come from Europe and North America. The top 5 countries visiting our tours are UK, US, Australia, Germany and France. Still, we’ve had visitors from countries Bulgarians consider exotic – like Egypt, Guatemala, Iceland, New Zealand and Singapore..
Over 370 tour groups – we’ve met and enjoyed the company of students and workers, backpackers and businessmen, kids and teenagers, babies and grandparents. Our guest are people who ended up here by chance to people who come to Bulgaria every single year on their vacations. 850 fans on Facebook and followers 120 on Twitter. 30 reviews on Trip Advisor, which are excellent and a-must do. For less than a few months Free Plovdiv Tour became the number one activity to do in Plovdiv. We partner and work with more than 50 locations across Plovdiv, including hostels, hotels, foreign and Bulgarian institutes, restaurants and others. Last but not least – Free Plovdiv Tour creates conditions for multicultural exchange and helps our guest feel welcome to Plovdiv. 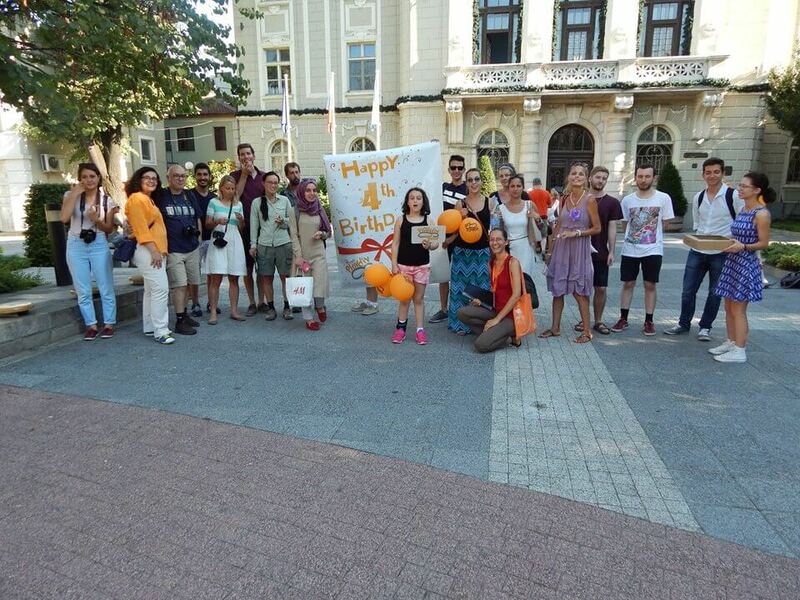 The first month in Plovdiv it was too hot and the tour started kind of slow – we had only 20 guests, but now we welcome almost 300 people every month. Sun and snow, hot and cold – we never stop! Join us in the great experience that Plovdiv offers and feel the heart of the city! If you are coming on the 13th even better – come to our first stop – the Central post office in the city to celebrate our very first birthday together with us. Here is a little preview of how much fun our birthday parties are. Only that in Plovdiv we will have more surprises for you!! !